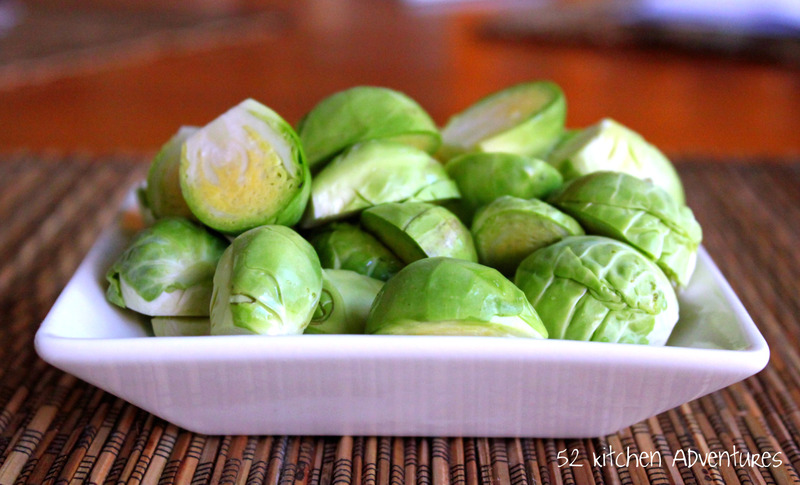 Now, I know what you’re thinking – Brussels sprouts aren’t unusual! 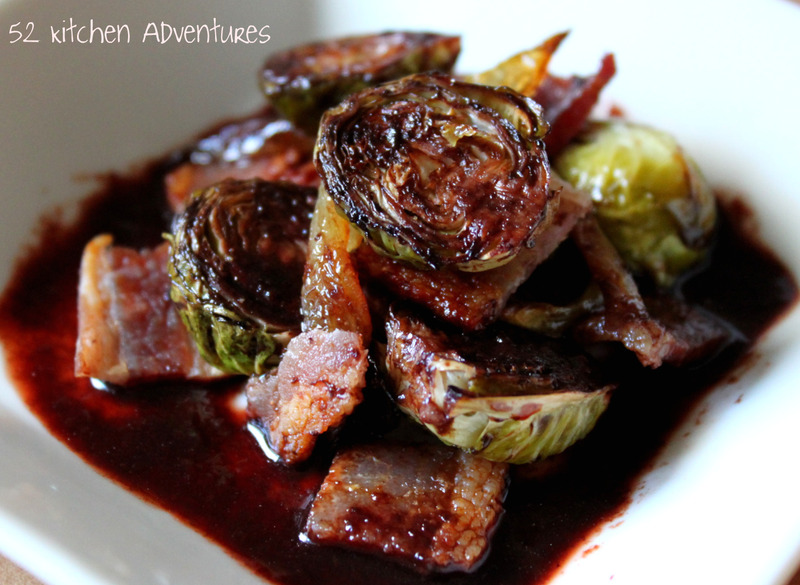 But the mission of 52 Kitchen Adventures is to demystify ingredients that you may overlook or avoid in the market and Brussels sprouts get such a bad rap. In reality, they are actually really good! However, if overcooked, glucosinolate sinigrin is released, which makes them taste and smell like sulfur. If you prepare them correctly (which isn’t hard, just don’t cook them so long), they are plump, firm, mini succulent wild cabbages. Surprisingly, I found in my research that 80-85% grown in the U.S. become frozen food. I’ve always bought them fresh and don’t recall seeing them in the frozen section. However, this implies to me that they should be available year-round, wherever you live, so no excuses not to try them! The little sprouts are related to cabbage, kale, kohlrabi and collard greens (all are cruciferous veggies). They contain vitamins A & C, folic acid and fiber. They are even believed to protect against colon cancer! More and more reasons to go out and try them again. This recipe has a nice balance of salty (bacon) and sweet (caramelized onions, strawberry), with a little tang (balsamic vinegar). It would make a great side dish or even appetizer. I hope this inspires you to try out this old childhood grievance, especially if you’re always avoided them! Cut off ends of onion, peel, and cut in half. Slice lengthwise to desired thickness, and peel apart the different layers. Over medium-high, heat enough olive oil in large saucepan to coat pan and onions. After a few minutes, add onion slices. Stir them to coat with oil, then let cook for around 10 minutes, stirring only occasionally. Add a dash of salt at this point, then continue to let cook without disturbing often. Stir occasionally, but allow onions to brown. If you stir too much, they won’t brown, but too little and they will burn. 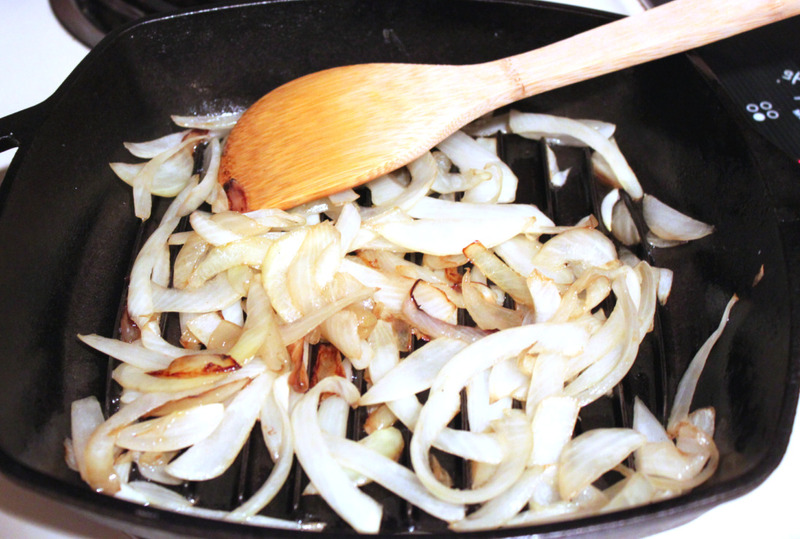 Continue to stir occasionally, scraping browned bits off the bottom of the pan, until onions are a deep brown color. It should take about 30 minutes to 1 hour. Puree fresh strawberries and push puree through a sieve. Place 1/2 C of remaining juice in a small saucepan with balsamic vinegar. Bring to a low simmer and cook for around 20-30 minutes, or until thickens. Preheat oven to 375°F. Cut the ends of Brussels sprouts off and peel outer layer of leaves. Cut in half and place in large bowl. Add about 1/2 of the reduction, or enough to coat sprouts. Toss to coat, then place them on baking sheet, cut side down. Sprinkle salt and pepper to taste and roast for 15 minutes. Flip over and cook another 10 minutes or until lightly browned. Cook bacon in onion pan or bake in 400°F oven and slice into small pieces. 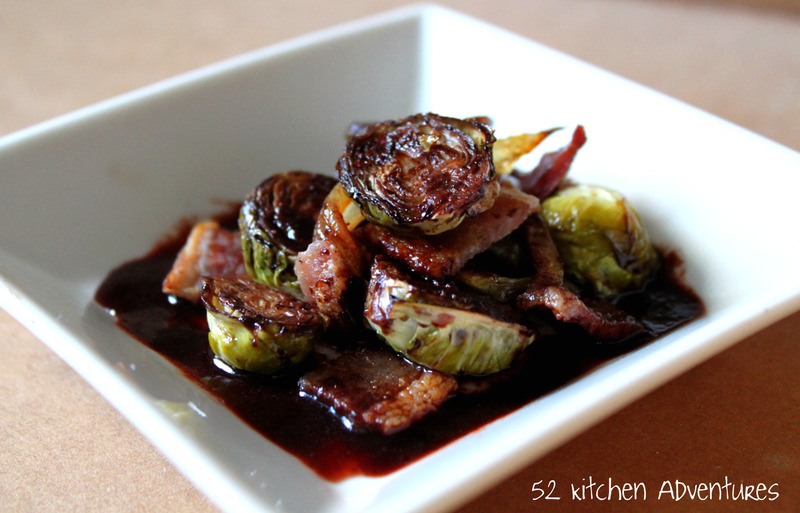 Combine caramelized onion, roasted Brussels sprouts and bacon pieces in a large bowl. Drizzle with extra reduction to taste. I have been *obsessed* with Brussels sprouts lately. It’s amazing how delicious they are, isn’t it?? Me too – for some reason I was really into them this winter. I love them, it makes me sad that they have a bad reputation. This recipe looks, so delicious! I cannot wait to try them! Thanks Ashley! Let me know how you like it. They are also really really good if you roast them for a long time, especially with more balsamic like this. I guess you have to cook them either quick or forever – no in-betweens! Cauliflower is also amazing roasted till it’s practically burnt. I don’t know how many nutrients they retain if you do that tho…. You can buy pancetta all chopped up at Trader Joe’s. I am substituting pomegranate concentrate in liieu of strawberry juice. I will let you know how they turn out. Sounds like a great idea – I’m looking forward to hearing how it turns out! I absolutely love brussel sprouts. This is a preparation I have never seen. I have some in the refridgerator now and I think I’ll try this recipe. Thanks. these look so incredible yummy… i can’t wait to try them!